I would like to meet this man. This is Gerald Smith. Mr. Smith teaches Rural Religion at the University of the South, Sewanee. He claims not to have "swapped a piece of paper with students for more than ten years" after committing in 1994 to maintain a paperless classroom. He is clearly a fine Urban Land Scout. Let us all send him Valentine's Day cards inviting him to visit Knoxville. UPDATE: I'd originally linked to this photo of Mr. Smith by the Tennessean's photographer, Larry McCormack (with very clear credit to Mr. McCormack). That link has since ceased to work...and I assume the Tennessean saw my re-posting of it as a violation of their copyright. 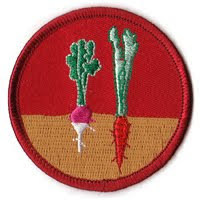 It seems that a lot of being successful growing things in the garden has to do with observing the plants often. House plants are good training for that. I like the hardy office varieties that can thrive in low light and survive neglect. I also like anything that blooms in winter (like Paperwhites or the more muscular Amarylis, both of whom are shown here and neither of which are doing well enough to bloom). Many varieties that do well as house plants can also be propagated by cutting (i.e. cutting off a bit and sticking it in water until it roots). Start some and give them to a friend. 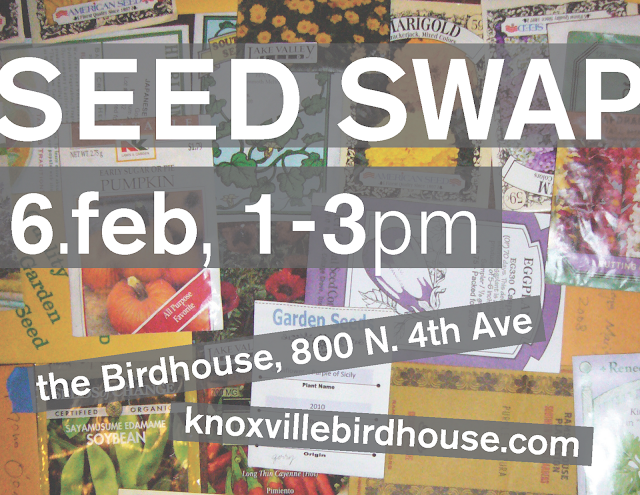 If your house is warm and you start now, you might even get roots before the upcoming SEED SWAP at the Birdhouse. Mark your calendars now: Sunday, February 6th, from 1-3 pm. Bring seeds, plant cuttings, seed catalogs, and any other resources to share. Tell your friends too. Spring is just around the corner. If you squint. Hard. Coneflower with crown of snow. Above is a scan of my favorite calendar of all time (and a bag of butterfly weed seeds to make sure I'm not reproducing the calendar's information). The calendar is called The Perpetual Garden Guide: What to do each month in the East Tennessee Valley. Author Connie Whitehead of Planted Earth Farms has been using "organic methods since 1985" and lays out in categories like Harvest, Start Indoors, Direct Seed, and Transplant, which plants need what care when. 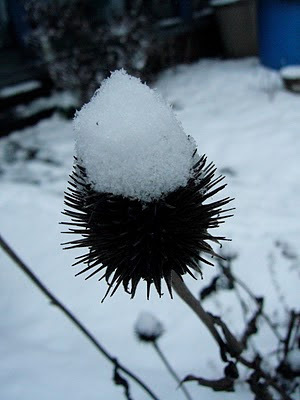 It is not specific to any calendar year, but to the seasons. It also has space for notes so you can return to it year after year as you learn what works and what doesn't in your area. 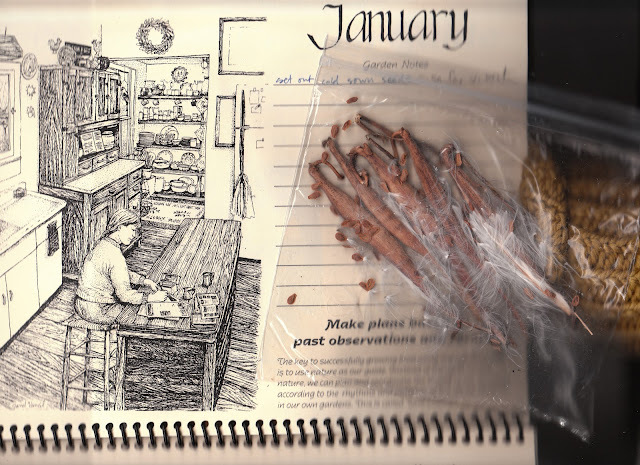 The calendar is finely illustrated by Janet Vancil. In the winter, I turn to this calendar like a picture book and in the summer as a level-headed and reasonable guide. You can purchase one at Three Rivers Co-op or contact Ms. Whitehead directly. Good gift for anyone gardening in the East Tennessee Valley. There is a stout history in the US and in Western Art (more generally) of romanticizing agricultural or "peasant" labor. 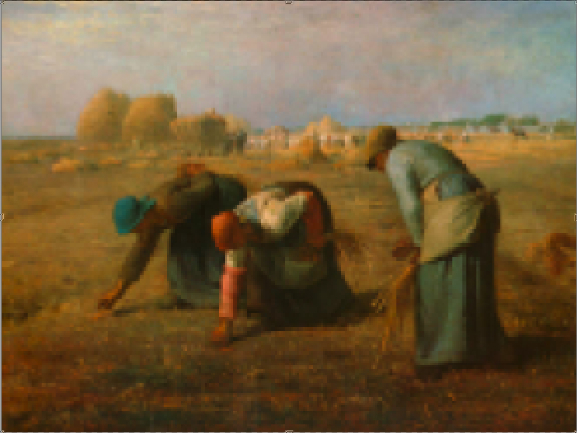 A prime example is Millet's painting The Gleaners (shown here extra pixelated for your pleasure). The image originally drew French attention to the backbreaking labor of scavenging for agrarian leftovers. Once imported to the United States, it became shorthand for pastoral fantasy, the issue of bodies, power, inequality, and labor lost to the commercialized reproduction of the image. I believe similar glossing over is a threat to any good and measurable progress that the myriad local/sustainable/just food movements would make. With that in mind I was pleased to find this online journal, The Journal of Aesthetics and Protest. If that's not conversational fodder for the best dinner party ever (and several PhD dissertations) I don't know what is! This article in particular, a conversation between Hynden Walch of the Hillside Produce Cooperative and Asiya Wadud of Forage Oakland, really got my heart pumping in a good way. Raised some good questions (for me) too.